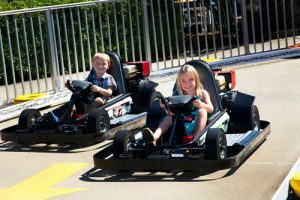 Racing go-karts is a time-honored tradition for the whole family in the Smoky Mountains, and The Track in Pigeon Forge is a popular venue in the region. The Track is home to several different go-kart experiences, enough for every member of your family. 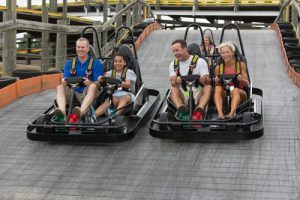 The Track isn’t just about go-karts: there are numerous other rides and experiences that make for a complete day of family fun in a great setting. With a name like The Track, you’d expect to find an exhilarating go-kart experience when you visit, and you won’t be disappointed. 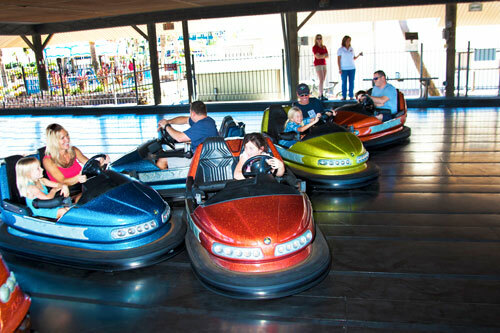 The Track at Pigeon Forge features several different go-kart levels to accommodate riders of all different ages, sizes, and experience levels. The setting has a nice older feel about it too, less frantic and more relaxed – a good way to lose the bustle of Parkway. The Family Track is the perfect option for almost anyone in your group who wants an exciting ride. It features some twisty curves so that you get that classic go-kart experience, but it’s also not too intense for most kids. If you’re up for something a little more thrilling, then the Wild Woody track provides exactly what you’re looking for. You’ll race against the competition across multiple levels, and there’s an exciting drop waiting for you near the end of the course. Of course, some younger riders want to have fun and still be on a somewhat tamer track as they gain experience. 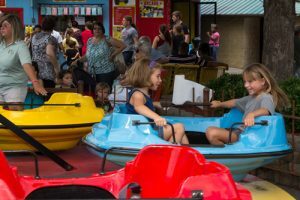 Kid can drive by themselves on the Rookie Karts and Kiddie Karts tracks, which are safe, circular, and keep the twists to a minimum. Sometimes, you just want to lose the wheels and experience the distinct pleasures of soaring through the air. If that’s the case, The Track at Pigeon Forge has you covered with options for aerial fun. The Sky Flyer raises you and your companions over 70 feet in the air in a harness. When you’re ready, you can pull a cord that will release you and send you shooting through the sky. There’s no feeling quite like soaring above the people on the ground and feeling the wind against your face, and that’s just what you get when you ride the Sky Flyer. To ramp up the action even more, The Track is planning to open a new thrill ride soon known as FlightLine. There you’ll have a chance to savor views of the Great Smoky Mountains region from the top of the 65-foot FlightLine tower before taking a spine-tingling leap towards the ground. When you’re ready to slow things down and engage in more relaxing fun, there are still plenty of things to do at The Track. The little ones in your crew can check out the entire range of kid rides, including swings, the Ferris wheel, the carousel, and a train ride. There’s also a fun miniature golf course called Gator Golf, with colorful jungle animals, soothing water features, and more. 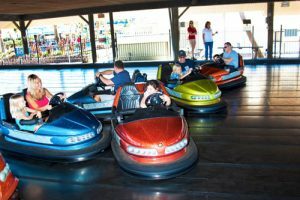 Additionally, there are bumper cars and even bumper boats – one of the most fun things at The Track, but you will get wet – so you can chase your friends and family around in a safe environment. Gamers in your group will definitely want to spend some time in Fat Daddy’s Arcade, where they can compete for prizes or play some of the hottest video games available. From arcade classics such as prize cranes to new favorites like Transformers, this arcade has a gaming experience to satisfy everyone.